Backbends seem to get all the glory in yoga practice. And for good reason! These are challenging asanas that go right to the heart of the yogi’s intentions – to live a life filled with love. 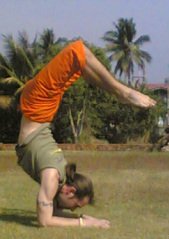 Backbends create room for fearlessness, and that is a challenging quality to practice and embody. But, through backbending, we become much more comfortable with moving fearlessly in our lives. This exciting Yoga vinyasa workshop will allow us to open our hearts and break free of what keeps us from joy. Please come ready for an intense asana practice. At Espace Bamboo (1st floor), 79 rue Hôtel des Monnaies, 1060 Saint-Gilles, Bruxelles. Only 16 places, hurry up!